“Err…you wanna go Neroteca?” I replied to rif. 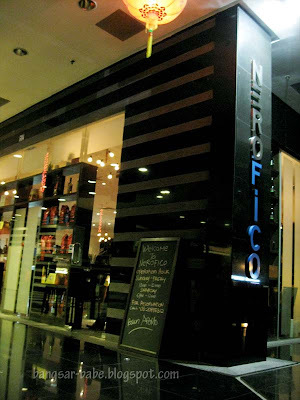 NeroFico, the latest addition to the Nero Group, is located in Wisma Perintis, Jalan Dungun. 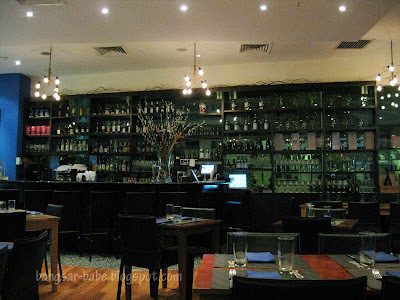 On a weekday night, the place was quiet, with only two tables occupied. A big difference from the boisterous ambiance in NeroTeca. 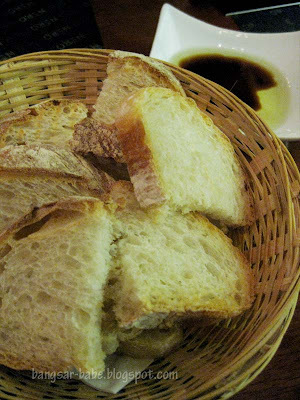 Once seated, a basket of bread with olive oil and balsamic vinegar dip was placed on our table. We scanned through the menu, placed our orders and hungrily ate the bread. Honestly, the bread was a far cry from the one served at NeroTeca. It was too dry and had to be generously doused with the dip. 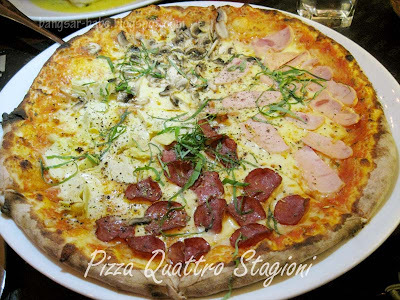 Pizza Quattro Stagioni (RM32) was a pizza with four toppings in each quarter; turkey ham, beef pepperoni, mushrooms and artichoke. 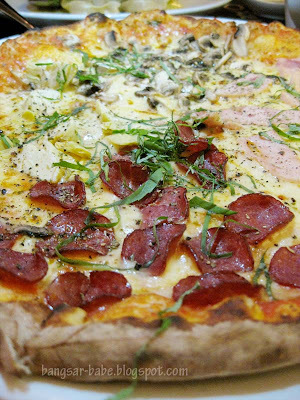 The pizza crust was thin, crispy and crusty, with a hint of wood smoke. Sadly, the toppings were disappointing. They were neither memorable nor flavourful enough. I thought the mozzarella cheese tasted a bit flat. 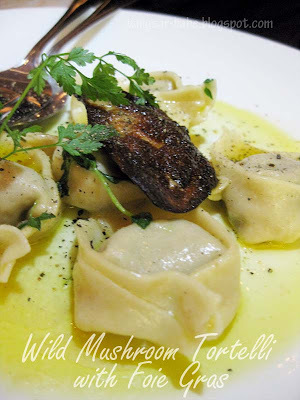 rif had the fresh tortelli with wild mushrooms in a butter and thyme sauce topped with pan fried foie gras (RM30). He liked it, but I found the sauce bland. The tortelli was packed with mushrooms was there was only five pieces on a large plate. I was very disappointed with the foie gras. It was overcooked, leaving almost none of the glorious fat behind. Instead of a lovely creaminess, the foie gras has a chewy and hard texture. 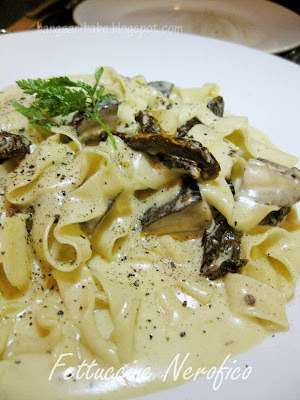 Fettuccine Nerofico (RM26) was an attempt to be different, but I didn’t find it impressive. Cooked with shitake mushrooms and sundried tomatoes, the pasta came with plenty of creamy, thick gravy. I expected it to be richly satisfying, but sadly, the whole dish was under seasoned. The sundried tomatoes helped cut through the richness of the pasta, but I didn’t like the ‘tang’ in my carbonara. Bacon would have worked better. We skipped dessert, because I was told the tiramisu had no alcohol and I didn’t want to fork out so much moolah for something non-alcoholic (I found desserts really overpriced!). Service was efficient, but aloof. Unlike the warm and friendly service I got at NeroTeca. 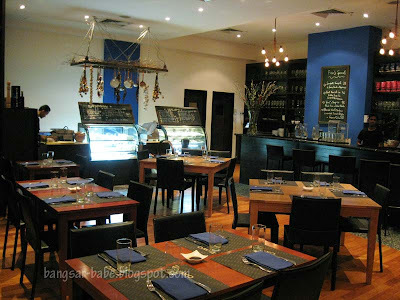 On a whole, I liked the ambiance and my company, but dinner was just average. Verdict: Average food, smaller-than-usual portions, higher-than-usual prices. 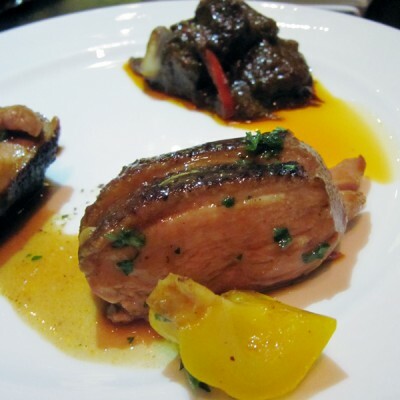 yikes, the foie gras looks like a charred sliver of bacon! maybe better luck with Il Padrino??? tangy carbonara actually sounds mighty fresh. For the usual cloyingly rich, creamy rendition with fat bacons may be delish, but ever so guilty after repeated attempts. Yum … lemme get my fix. I heard Neroteca's quality also dropped, as it seems all the chefs left them. Sigh. Ah I love Italian food, but if the cheese was FLAT and the bread was hard(! ), total disappointment ok! iamthewitch – Yeah…that's a downer for me too! boo – Shucks…I hate it when that happens. Sean – It tasted horrible too!! This was a waste of my money. I ordered this to go, but had I eaten in restaurant I would have sent my food back and left. $10 for a margarita pizza? That is more expensive than the US or Italy! Ridiculous that they think they can charge that much money for what they call pizza. What I received was a piece of rubbery bread with a smear of tomato sauce on it. Even the caesar salad was a disappointment. $11 for lettuce! What a disappointment. DO NOT EAT HERE!